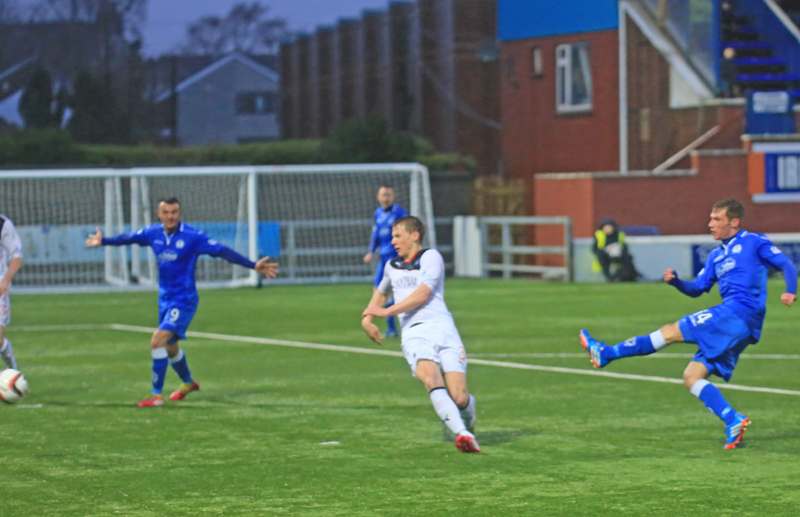 Two goals in the final ten minutes from substitute Gavin Reilly were enough to give Queens all three points in this afternoon`s Championship clash at a wet and windy Palmerston. 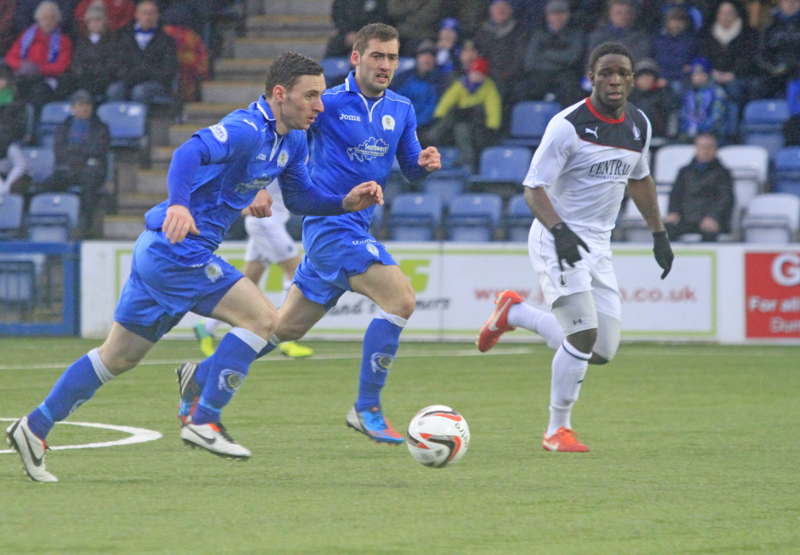 The win for Queens extended their recent unbeaten run to 5 games and in the process ended Falkirk`s impressive 11 match unbeaten run. The game was once again played in less than favourable conditions, as a strong gusty wind accompanied by driving rain certainly affected the game, and full credit must go to both sets of players who produced a decent game and although the weather was poor, it was certainly nowhere near as bad as it was when the original game was abandoned back in December. Following last weekend`s victory at Livingston, Queens made one change to the starting line-up as match winner Derek Lyle replaced Gavin Reilly up front. Michael Paton shook off a knock, and once again, Jim Atkinson retained his place in goal, and along with loanee, Bob McHugh, made his Palmerston debut. Recent signing, Mark Kerr was also named amongst the substitutes. League leaders Falkirk included both new loan signings, Joe Chalmers and Mark Beck in their squad, whilst defender David McCracken returned to the squad after a spell on the sidelines. They also included the Championship`s second top scorer, locally born, Rory Loy up front. After winning the toss, Queens elected to change ends and lining-up in a 4-3-1-2 formation, they attacked the Portland Drive End in the first period hoping to benefit from the driving wind that was quite clearly going to affect the game, and as early as the opening minute they created a really good chance to take the lead, but the ball across the goalmouth had no takers and the chance had gone. Queens kept up the momentum and Kevin Holt escaped past two defenders but as he shaped to shoot, team-mate Bob McHugh got in his way and the full-back`s shot ended up being well off target. Falkirk`s first half chance came after 8 minutes when Chalmers tried his luck from just inside the box, but his effort from the angle went a couple of yards past the far post. Both sides were struggling to adapt to the conditions, with passing to a colleague being more of a hit and hope, rather than something measured. The visitors were forced into making a change as early as the 17 minute when Millar was injured after making a tackle in midfield, and after treatment he hobbled rather painfully off the field to be replaced by Durojaiye. Falkirk threatened again after 24 minutes as Roberts escaped down the right, but his cross to the near post was headed well wide by Loy. The game was fairly equal at that point with both sides carving out a couple of half chances, but after 28 minutes, Queens had an excellent chance to go in front. The best passing move of the half involving Ian McShane, Kevin Holt and Paul Burns opened up the visitors defence down the left, and when Burns delivered a perfect pass across the face of goal, it seemed as though Bob McHugh would mark his Palmerston debut with a goal, but unmarked, and from 3-yards out, he somehow managed to side-foot the ball wide of the post. A drive from distance from Paton wasn`t all that far away from opening the scoring as Queens began to have more meaningful possession. The first yellow card of the game was shown to Mark Durnan for a late challenge on Roberts just inside the Falkirk half, and moments later, Queens went close once again, this time their efforts were thwarted by `keeper McGovern who got down well to his right to push Paton`s left foot drive away for a corner. As half-time approached, Falkirk had what was probably their best effort on goal in the first period when following a corner, Durojaiye collected a clearance on the edge of the area, before hitting a decent strike only just wide of Jim Atkinson`s goal.The final action of the half saw Queens win a corner after a shot from McHugh was blocked away, and from Mitchell`s delivery to the far post, Andy Dowie climbed high above the defence but could only steer his header a foot or so past the post. So the half ended as it had started with Queens going close to opening the scoring, but not quite being able to break through the Falkirk rear guard. Neither side made any changes at the break, and now it was Queens turn to face the strong wind as they aimed to maintain their recent good run of form. The opening phase of the second period was a little cagey as both sides tried to adapt to playing the conditions, and the first two chances of the half, one to either side, came as results of defensive mistakes. Firstly an error of judgement allowed Michael Paton a shooting opportunity, but his final effort was fairly tame and was easily saved by McGovern, and then Dowie was dispossessed by Loy which resulted in Alston having a shooting chance, but with Atkinson well beaten, the shot cleared the far post. Queens suffered a blow when Stephen McKenna was cautioned following a challenge on McGrandles, the booking means the midfielder will now miss the next meeting of these two sides in a fortnight. As befits a team on such a good run of form, Falkirk tried to raise their game,but even though they were boosted by a good number of travelling fans, the best they could muster was a snapshot from Roberts that was comfortably held by Atkinson, and it was the home side that began to dominate the contest. Just after the hour mark, new signing, Mark Kerr became the third player to make his Queens home debut, the experienced player replacing youngster Ian McShane in the centre of midfield. Centre back, Mark Durnan was next to go close following a free-kick on the right, when Mitchell`s deep delivery was caught by the strong wind and although Durnan reached the ball, there was no power in his header, and McGovern saved easily. Queens made their second change of the game on 68 minutes when Gavin Reilly replaced McHugh, and the young striker`s introduction had a major bearing on the outcome of the game. Possibly the best move of the game almost led to Queens opening the scoring on 74 minutes. After collecting the ball deep in his own half, Michael Paton twisted and turned his way out of trouble before finding Derek Lyle wide on the right with a fabulous pass, the Queens striker showed tremendous skill to go past the covering defender and whipped in a measured cross that found the on rushing Paton 8-yards out, but somehow McGovern produced a wonderful reaction save to keep his team on level terms. The visitors were reduced to shooting from long range, and although Jim Atkinson had a slight `wobble` from one such effort by Durojaiye, catching his shot at the second attempt, the young Queens `keeper had a pretty comfortable afternoon. With Queens continuing to look the most likely team to score, the all important opening goal duly arrived after 81 minutes. Derek Lyle found space on the right and his perfectly flighted cross into the 6-yard area found Gavin Reilly, and with the Falkirk defence posted missing, the substitute nodded home from close range. The goal was nothing more than Queens deserved, and was their 50th competitive goal of the season, and just 5 minutes later, it was swiftly followed by goal number 51 as Queens sealed the victory. After a move down the left which involved Holt and Kerr, a neat through ball played in Gavin Reilly, and the young striker thumped an unstoppable shot past McGovern to score his and Queens` second goal of the game. The goal was enough to see the majority of the Falkirk fans head for their transport home on the day that their team`s excellent recent run had finally been ended. There was even a further opportunity for Queens to add to their tally when Paul Burns burst into the box, but with only the `keeper to beat his shot from an angle on his weaker left-foot lacked the accuracy to beat McGovern. Sponsors choice of man-of-the-match went to Stephen McKenna, and the crowd of 1818, the biggest league gate since the opening day game against Dundee, were entertained to a decent game of football in what were truly awful conditions.So to sum up, an excellent result and performance against the team that began the day at the top of the table, more of the same next week against Dundee will do just fine. 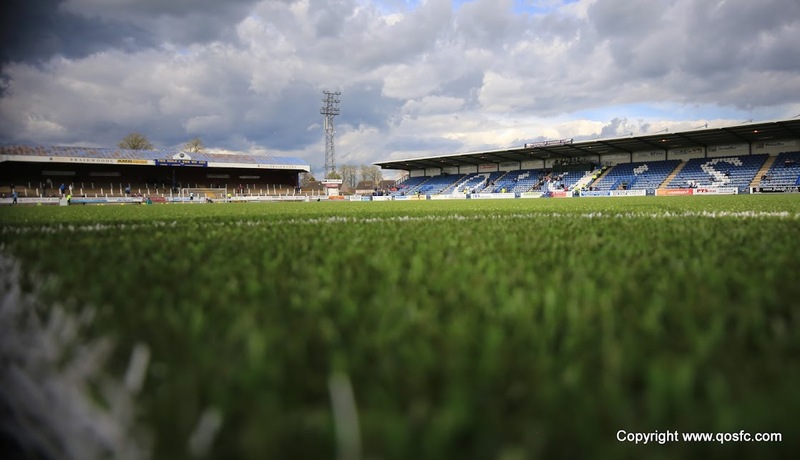 14:16 Team news on the way for today`s game against Falkirk. 7 min Chalmers comes close for Falkirk in conditions which are eerily similar to the postponed match in December. 17 min Falkirk forward Mark Millar hobbles of with an injury after 16 minutes. 24 min Penalty claim for Falkirk waved away by Referee Iain Brines. 27 min McHugh misses a golden chance from six yards out! 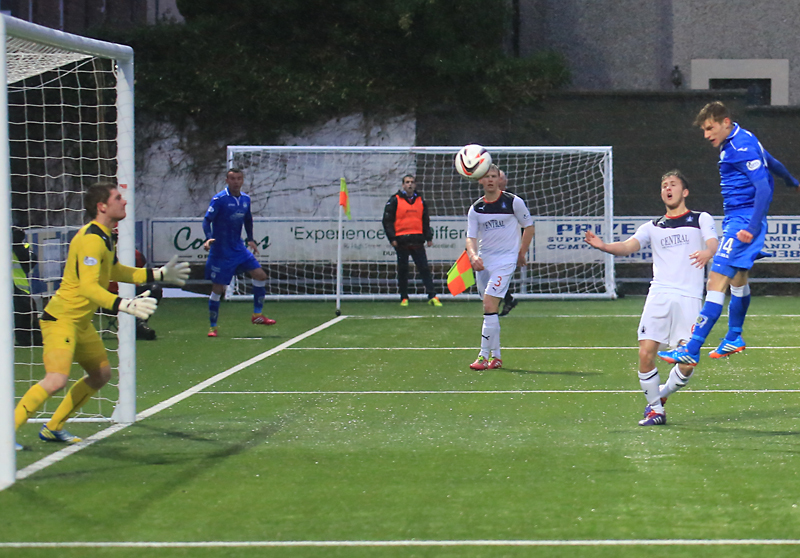 30 min Paton goes close for Queens with an effort from 25 yards out but it goes inches over the bar. 35 min Durnan makes a cynical challenge on Roberts on the half way line and is cautioned. 43 min More pressure from Queens as Paton goes close again. Less than 5 minutes to go in the first half. Half Time A wet and windy first half provides plenty of chances but no goals. Half Time Today`s attendance at Palmerston is 1818. 55 min Cagey opening 10 minutes in the second half with no real chances created. 74 min Queens are denied by a brilliant McGovern save. 15 minutes to go. 81 min The substitute Gavin Reilly puts Queens 1 up with a header from six yards out! 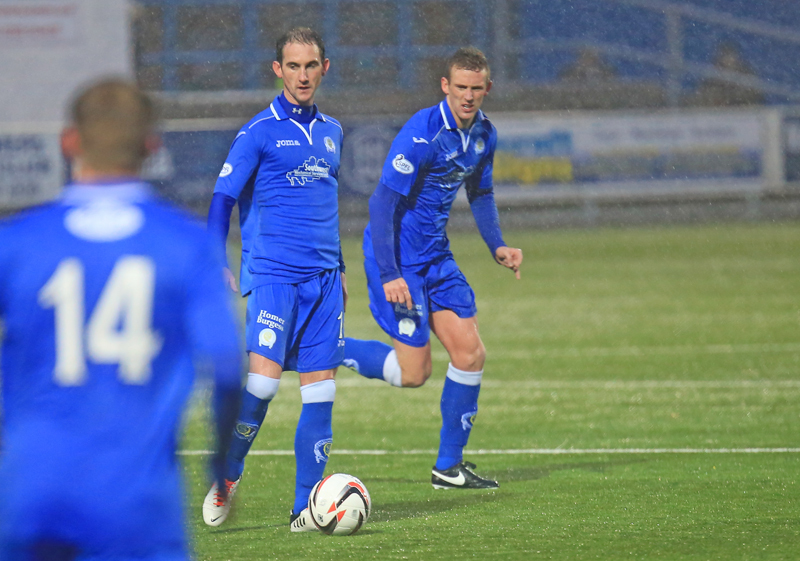 85 min We`re in to the last 5 minutes at Palmerston. Can Queens hold on and boost their promotion chances? 86 min Yes they can! Queens are 2 up and Reilly scores his second of the day! 87 min Reilly with both goals as Queens promotion push continues! 5 to go here. 89 min Today`s Man of the Match goes to Stephen McKenna. 16:52 Queens march up the table continues with 13 points out of 15 in the last five games.